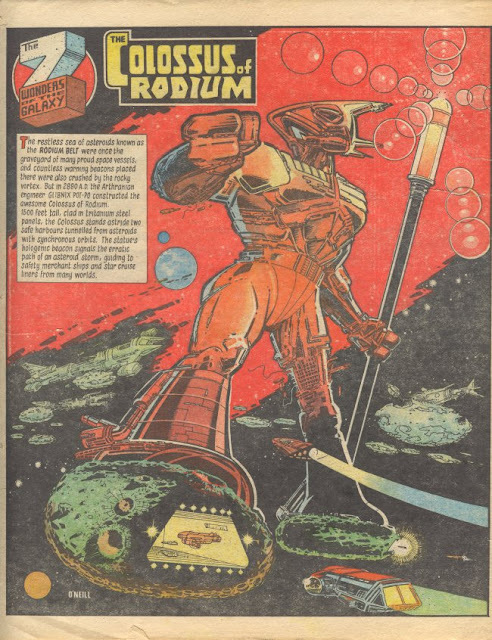 -but he came back to finish Nemesis the Warlock in Prog 2000, and then in Prog 1280 he had a page in 25th anniversary lark ‘A night to Remember’. I guess he may yet be lured back one day. Please? -including his hand in creating Diceman, and Metalzoic, but not including his work on Toxic!, 2000 AD’s one-time rival from the early 90s. Torquemada - arguably several creations in one character! He had a look with a helmet, then a look with a face destroyed by a teleporter accident, then a version as a phantom. Amazing. The Terror Tube - something of a character all by itself. A random selection of Cursed Earth mutants - most seen on this panel only! That's commitment. O’Neill’s art was a major part of my introduction to 2000 AD, via reprints of Nemesis the Warlock Book 1 in the earliest issues of the Best of 2000 AD monthly. It is impossible to overstate how joyous and brain-exploding it was to behold. It managed to be both accessible and impossible, masterful yet scrawly, and just full of so much detail that poring over the pages even today, after so many readings, still yields new delights. I wanted to spend hours copying it, but also never imagined being able to create that kind of thing from my own head. This. This is the kind of thing I wanted to be able to draw. Illuminated borders made of living wax. What makes it all the more amazing is that O’Neill very much appears to have learned his skill on the job. 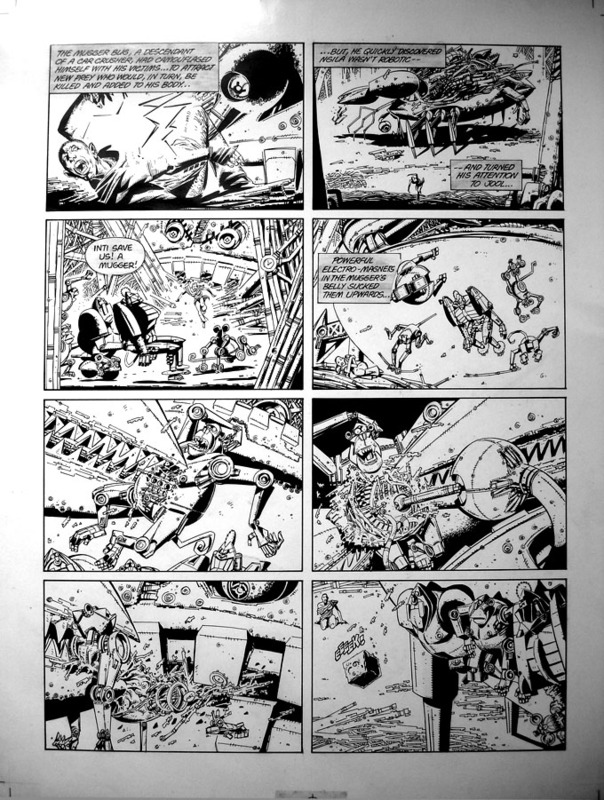 As art assistant on the Prog from the very start, O’Neill had the painful job of censoring and re-drawing all sorts of work by artists with very different styles – sometimes just to make the page fit better, but often to cut out blood, gore and general ultra-violence that the management feared (but the readers loved). So that meant finding the ability to simulate everyone from Ramon Sola to Dave Gibbons to Massimo Belardinelli. I’ve not tried to find doctored panels, but I bet it’d be tough. One of the jobs he liked least was whiting out artist’s signatures, something IPC management insisted on in the dark days of the 1970s. 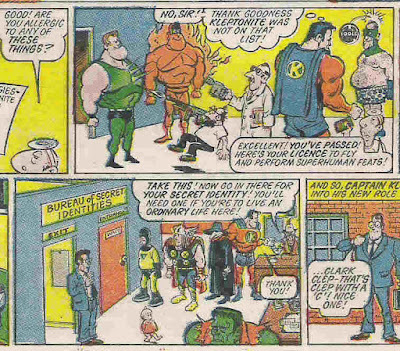 On the back-room side of things, Kevin O’Neill’s greatest achievement was the insertion of the Creator credits box into the pages of a mainstream newsstand comic. There's one, in the bottom left corner. In amongst all the other gorgeous clutter. I’m hazy on exactly how it went down, but I get the distinct impression that he just slipped them into a Prog one day, upper management didn’t notice, and by the time they did it was too late, and anyway it didn’t result in the death of newsstand comics. *** It’s the sort of behaviour that maps perfectly onto the ‘a bit naughty but absolutely well-meaning and ultimately heroic’ actions of Ro-Jaws and his ilk. Nice one, Kev. So anyway, Kevin O’Neill wasn’t as such hired to be a strip illustrator, but he got his foot in the door through art bodging and periphery. Remarkably, his first published strip work was on stories he wrote and drew (and maybe lettered as well!). This covered an early Future Shock, and 2000 AD’s first irreverent cartoon strip, Bonjo from Beyond the Stars. The fact that this isn’t especially good doesn’t matter! It helped sew seeds of greatness to come, including the early, deeply cutting episodes of Captain Klep, (from its Tornado days, and then the extended run of the Flash Gordon parody Dash Decent. In these short one-page jobs alone you can see his work improving. Washed-up superheroes, some 10 years before Marshal Law. While D'ash Decent fights alien eyeballs, O'Neill (or was it writing partner Dave Angus?) calls his own good taste into question. But the real meat came with his foray into Ro-Busters. I have an idea that it was Kevin O’Neill who dreamed up the basic look of Ro-Jaws, and maybe Hammer-Stein (and perhaps some others), but I don’t know for sure. What I do know is that the handful of episodes he drew were dead good. Its the Star Wars cantinas scene, but with robots. It’s also a matter of record that the tube escape sequence he drew for The Fall & Rise of Ro-Jaws and Hammerstein ended up directly inspiring the story Terror Tube, (a deliberate two finger salute to IPC management, who hated it), which in turn led directly to Nemesis the Warlock, the finest piece of graphic fiction devised by man. 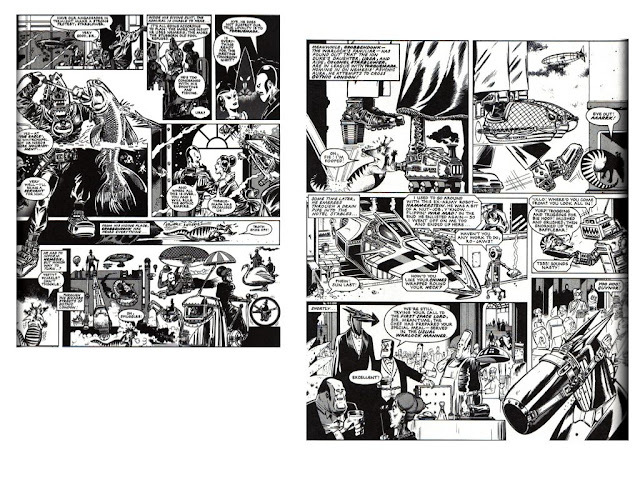 Already a master of detail and imagination, it’s at this point that Kevin O’Neill stopped being an assistant who dabbled in drawing to being one of the premier comics artists to grace the UK. You can tell O’Neill poured his heart and soul into Nemesis the Warlock. There’s just so much going on in each page! Book 1 was plagued with gaps in its publication schedule, no doubt because of the extra efforts he went to. 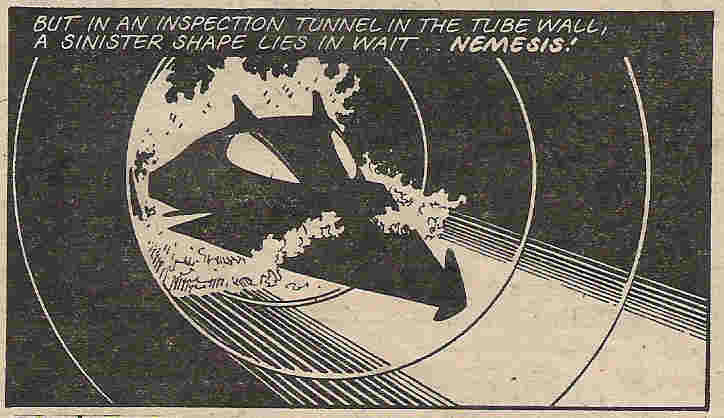 Amazingly, he re-did (and coloured) large chunks of it later on so it’d fit better into the original reprint of Nemesis that was published in small American-size comics. Even more amazingly, the story goes that what we currently know as Book IV episode 1 was actually the first bit of Nemesis that O’Neill drew, in all it’s mechano-steampunk glory. 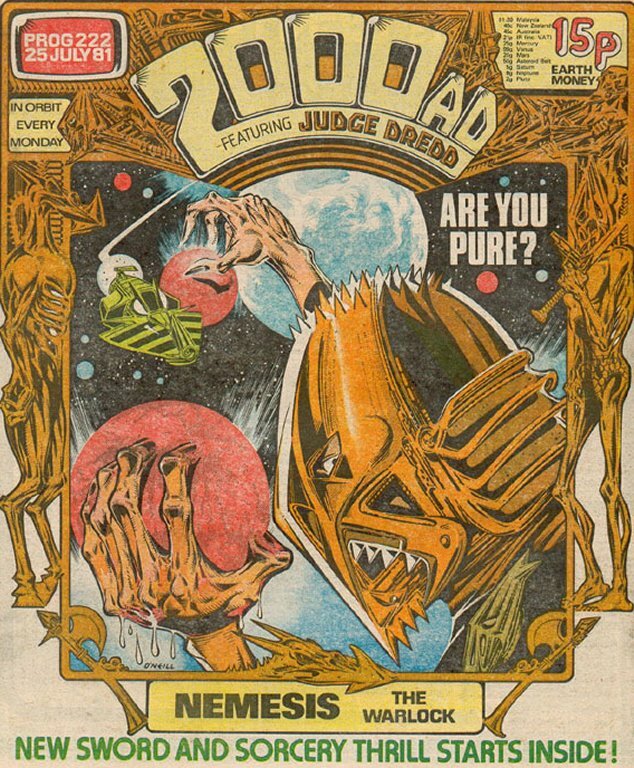 At first deemed too weird, Pat Mills managed to make it fit later. And of course in the 21st century, steampunk continues to be all the rage, not least in the pages of 2000 AD. Visionary stuff. Delight in the details. And the horse bag. Nemesis Book II was given to another artist to allow O’Neill a longer lead time with Book II, which did eventually see print in a continuous run. And by gosh was it spectacular. Huge great scenes straddled the pages with monsters of design work, battle carnage, interspersed with quiet moments of emotion. But, sadly this heralded the beginning of the end of his time with 2000 AD. It was around this point that American comics took an interest, despite finding his work inherently scary. I don’t know the exact chronology, but he must’ve worked on the original version of Metalzoic soon after. This was commissioned and printed as part of DC’s first wave of original graphic novels, but was also run in 2000 AD (in black and white), I guess in a similar deal to the current Judge Dredd Megazine slot reserved for creator-owned work. Metalzoic is mental. It’s Pat Mills, so the idea and ideals loom larger than the plot, but in many ways this is something of a proto-Image comics book. You get sucked in by the art, you want to know more about these weird prehistoric-looking robot creatures, although you don’t necessarily find out that much about them. O’Neill is on top form throughout. In turn, he produced Torquemada the God, a 5-part bit of lunacy that paved the way for new artist John Hicklenton to take on the main Nemesis series. 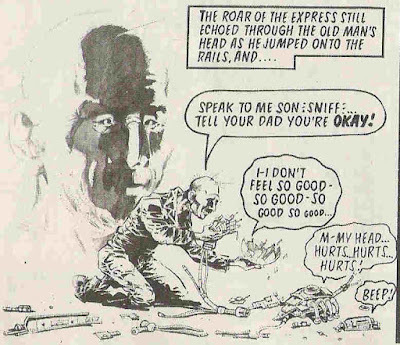 I fear I’ve not remotely done justice to O’Neill’s skills as a storyteller, and an artist who conveys mood, tone and character as well as any of them. 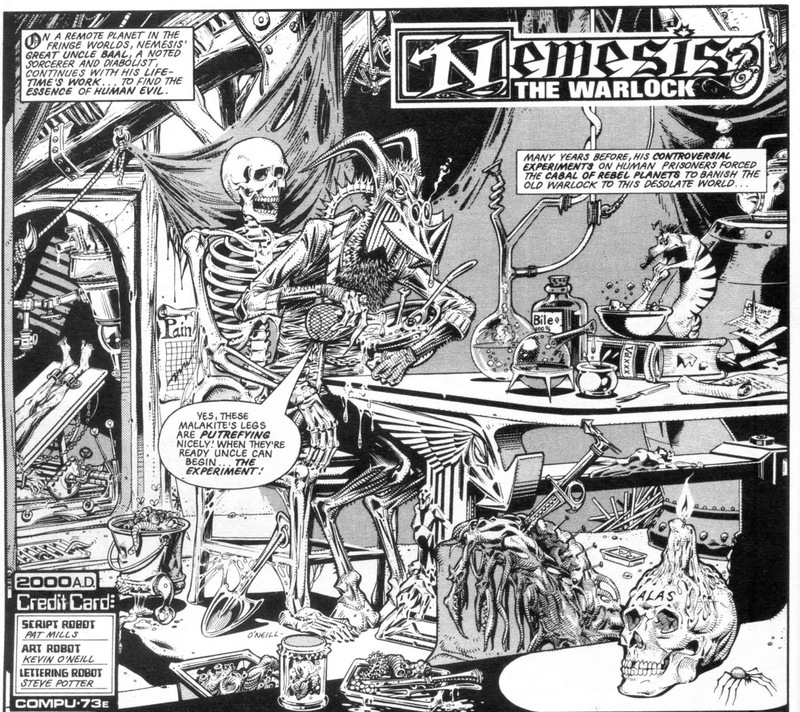 Nemesis the Warlock is an odd beast of a story. It pushes a lot of buttons, including horror, humour, anger, action, social commentary – all of which its various artists have been adept at drawing out. But although this mix is in its DNA, it’s surely O’Neill who made sure us readers got it right from the very start. Pure action wwith N'Kognito. Nice! As I understand it, he’s full-time at work with Alan Moore on the continuing exploits of the League of Extraordinary Gentlemen. But maybe, just maybe, the right job will come along to get him a page or 5 in the Galaxy’s Greatest comic? He’s one of the leading contributors and anecdotalists to feature in Future Shock! *The internet doesn’t seem to want to credit any specific artist with the design of Ro-Busters, and specifically the characters Hammer-stein, Ro-Jaws, Mek-Quake and Howard ‘Mr. 10 percent’ Quartz. I have a strong suspicion that Kevin O’Neill has more to do with it than Carlos Pino or Ian Kennedy, who drew the first published episodes. I apologise unreservedly if I’m wrong! **I expect most readers here will have heard (more than once!) 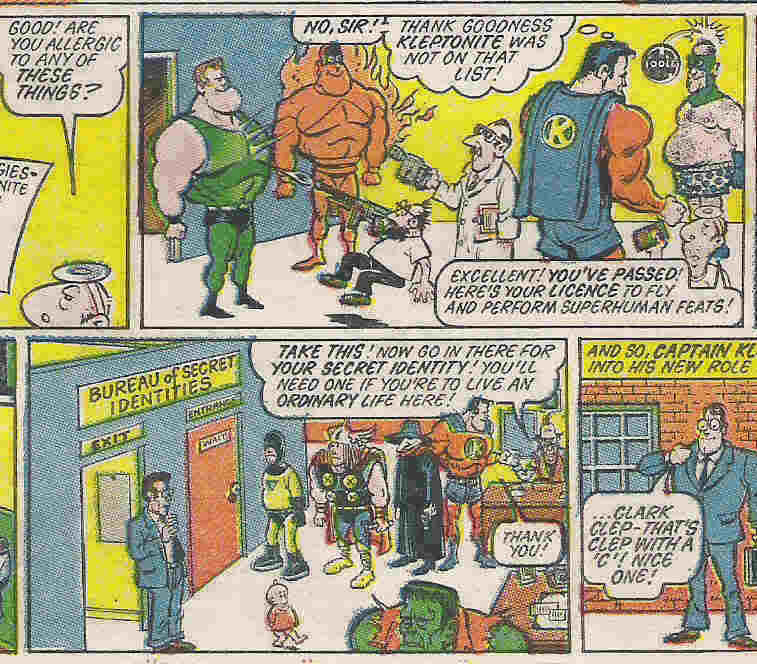 the wonderful anecdote about management-types at DC comics declaring O’Neill’s art to be too scary for young readers. They couldn’t point to any one panel or depiction, just the whole style! 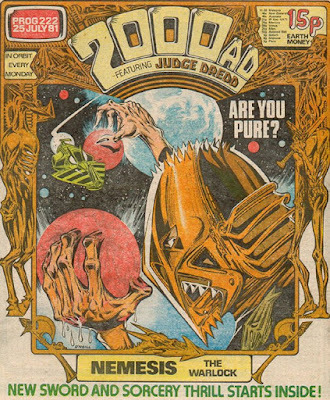 ***It IS true that many of 2000 AD’s top art talent found work beyond the comic after a few years, but one imagines the US editors who lured them away with promises of hard cash / a decent living wage would have found out who they were without needing the credit boxes. Frankly, the old comics practice of not crediting the creators involved just seems weird. ****2000AD has played host to a number of weird and wonderful one-page oddities that are something of a hidden part of the comic’s history. O’Neill’s ‘wonders’ were preceded by the Supercovers, but later Progs had Mick Austin’s ‘Things to Come’ or Shaky Kane’s ‘Beyond Belief’ to name just two examples.